the junkyard of my own viscera. the hairs on a slabbed kneecap. of wind through the fur of a maimed gazelle. she will hold and make proper again. on the counter. You will come to know this was love. Natalie Eilbert's work has appeared in or is forthcoming from Colorado Review, Spinning Jenny, Bat City Review, La Petite Zine, Copper Nickel, The Rumpus, DIAGRAM, Barn Owl Review, and elsewhere. She was named a finalist in YesYes Book's Inaugural Chapbook Competition for her manuscript, Swan Feast. 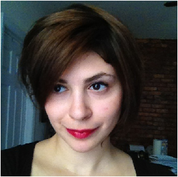 She is a founding editor of The Atlas Review (www.theatlasreview.com).